I am guessing that many of you have found steps() to be confusing when using it in CSS animations. I wasn’t sure how or why to use it at first and searching seems to produce two main examples: A typing demo by Lea Verou and an animated sprite sheet by Simurai. These examples are genius and really helped me begin to understand this special little timing function, but they are such prominent references that it was hard to imagine how to use steps() outside of the context of each demo. So, I really got into steps() and built a few animated demos to help those that might be as confused as I was in tackling this elusive beast. steps() is a timing function that allows us to break an animation or transition into segments, rather than one continuous transition from one state to another. The function takes two parameters — the first specifies the positive number of steps we want our animation to take. The second parameter defines the point at which the action declared in our @keyframes will occur. This value is optional and will default to “end” if left unspecified. A direction of “start” denotes a left-continuous function and our animation’s first step will be completed as soon as the animation begins. It will jump immediately to the end of the first step and stay there until the end of this step duration. A direction of “end” denotes a right-continuous function and directs the movement to stay put until the duration of the first step is completed. Each option essentially moves the element from a different side and will produce different positioning for the same animation. Before we get started it’s important to understand how a different fill mode or iteration count will impact steps(), like the use of “forwards” or “infinite,” for example. If we have two cars with the same animation duration and the same steps() values, but one is directed to continue infinitely while the other the fills forward, the perceived end point of these two cars becomes very different, even though they start out from the same y-axis point. The use of “forwards” commands the animated element to extend the styles from the last @keyframes of your animation to play beyond the duration of the animation and retain that state. Combining it with steps() in the animation makes the action appear as if the initial motionless state is not counting towards the total sum of steps, as it should with “end”, or that the car is taking an additional step beyond your steps() declarations, depending on how you look at it. Now, let’s take a look at some more code and try to make sense of this bit of trickery. A clock is ideal for demonstrating steps(). We need the clock’s hands to rotate, but not in smooth and continuous movements. Using steps() will allow us to create a motion mimicking that of hands on a real clock. There’s a bit of math involved when using steps(), but it’s not too painful. We want the second hand to to rotate 360 degrees through 60 steps and to complete the animation within 60 seconds. The clock’s animation declaration breaks down to 1 step per second. For the minute hand, we can assign the same @keyframes, but need different timing. We will multiply 60 by 60 to get our animation duration. Our hand will move once every 60 seconds, 60 times to complete a full 360-degree rotation. Disclaimer: Don’t rely on this clock to carry out your daily activities because, you know, it’s a CSS clock. CSS cars demonstrate the difference between using “end” and “start” within our steps(). “Start” causes a car to move right away and stay until the duration of 1 step is complete. It will appear as if the “start” car is positioned further right than the “end” car, but if you add an animation delay to the second car you can see that both cars originate from the same y-axis point. “End” causes the animation to essentially complete the designated time of 1 step before the animation begins its action. By the time our first car gets moving, it is on its second step so the cars have no chance of moving in sync. The white borders in the demo represent the start and end points of the animation. 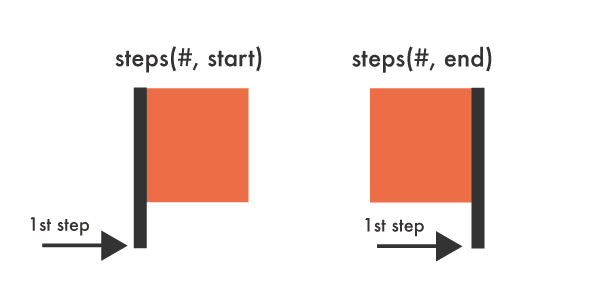 Another way to better understand steps() is to take it quite literally and create actual steps. For this example we will be using bear paws. This demo uses one image consisting of six bear paw prints. This image is covered by a <div> and we want to move that <div> with steps() to reveal the paws in a way that mimics actual prints being left behind. Without using steps() for this the <div> would move to the right in one fluid movement, which is not the effect we are going for. We want each paw to appear whole and at once. As mentioned, there are six paw prints. We need to animate our <div> to move the full length of the image (675 px) while revealing one full print at a time. Our <div> will move to the right 675 pixels in 7 seconds through 7 steps. This works out to each step being about 96 pixels wide. “End” means that our animation will stay in its initial state covering all the prints until the first 1 second step is completed. In this demo we are using “start” with our animated opacity change. When we change opacity in animations we can use steps() to complete this action in clearly defined stages. Using “start” makes a percentage of the color visible immediately even though its initial opacity is “0.” A value of “end” in this instance would start us off with an invisible circle. The change will happen in five steps within 5 seconds, equaling one stage per second. Our percentages are also moved with steps(). All the percentages are located in the same <div> which we are moving up 380 pixels. Our initial “20%” exists in the circle from the beginning, so we need to move the <div> to expose the 40%, 60%, 80% and 100% through four steps. Again, using “forwards” here impacts the number of steps we use in a different way than “infinite” does in the previous demos. If we changed this to “infinite” we would miss our “100%” completely because “forwards” is commanding it to go an extra step outside of what is listed within our declared steps(). The steps() timing function can be really tricky to understand, but pretty handy once you get the hang of it. The CSS function allows us to chop our animations into clearly defined stages, or speed things up to create smooth movements. Hopefully these demos inspire you to use steps() effortlessly in your CSS animations. Happy stepping! Joni Trythall learns web design by day, and forgets it all by night. She is constantly trying to combine her love of learning code with her long time obsession of coloring mostly in the lines. Joni lives in always sunny Seattle, WA. You can find her code ramblings at jonibologna.com, Google+ or @jonitrythall. Great article, made me want to try it out. Haven’t herd of steps() before, whats the browser support for it? Hi Jordan, thanks for the comment. Desktop support looks good across the board with modern browsers unless you go below IE 10. There is also strong mobile support except IE and Opera. Chrome 35.0 and everything stands still.. Why? Hi Sander, I did some limited testing on Chrome for Windows and did not see any issues. Can you elaborate? Hi Sander, Do not consider compatibility? Thanks. Just what I needed to get into some CSS animating. OMG! I just completed CSS Course. May be, to understand this, I will have to die 30 times and become alive 30 times, then there are probabilities of me understanding this. Totally agree! had to leave it in the middle, hard for the beginners. Firefox and chrome for mobile works like a charm.. It might seem kinda silly to cut and paste iterations. But doing so, you learn the kinks of looping logic. Like nth last un-timed comes first in raw CSS. Your examples are so simple, using assumptive gaps. But as some may point out, prone to failure for some devices and browsing agents. Maybe, somewhere include an animation with all the meat and bones. Mind you, this makes life sweet on a network, tested and true. Nice blog. Hello, one important question that i’ve been struggling with is how to make this responsive? is it even possible ? actually, I really think start/end is needless, but it makes it’s hard to understand. In my opinion, start/end means whether a step goes at the start/end of a time frame (say, begin/end of one second). If you refresh the demo, you can see the second car moves quickly from origin to the first step at the beginning of the animation. Cool tutorial, thanks. I found that adding the following to the cars made it a really smooth transition. Can we time the steps in unequal intervals? Say, I want to make a discrete transition at 0%, 20% and 100%? Since the transform doesn’t change, shouldn’t the end position be the same in both cases?